Street Eats. We are all familiar with its recent evolution, as well as the surge in the popularity of curbside cuisine. Chefs are using imagination to develop their own specialties to entice customers to experience something that was once only available in brick-and-mortar bistros. Dynamic delicacies from rolling kitchens have created a culture of faithful followers, who are loyal to each one. Evidence suggests that this trend will continue to grow at a pace that is exponentialin the future. This is very encouraging for both, patrons, as well as the entrepreneurs who have decided to break with traditional foods, and develop a menu line that is unique and vibrant. But what about the traditional street eats, and where do they fit into the dynamic of this popular culture? It is the mission of Team Triangle Street Eats to explore all of the aspects that make up food truck cuisine, and give it a fair and impartial review. In this edition, we visited one such staple of the food truck industry, the Philly Cheesesteak sandwich. We planned on attending the Draft Line Brewing Company’s grand opening in Fuquay-Varina on June 28th. We had also anticipated that we would be able to select from ample food trucks, but as fate would have it, several that were scheduled to attend experienced mechanical problems, leaving just one food truck, Philly’s Cheesesteak. Some things are just meant to be. The Belle and I arrived at Draft Line Brewing Co. a little before noon. It would a little while before the Traveler would be joining us. A crowd had already started to form for the grand opening. I had looked over the line of crafted beers, and had decided on the Hemmings Pilsner for a ‘primer’. I’m more a Lager/Pilsner drinker, than a PA/IPA drinker. 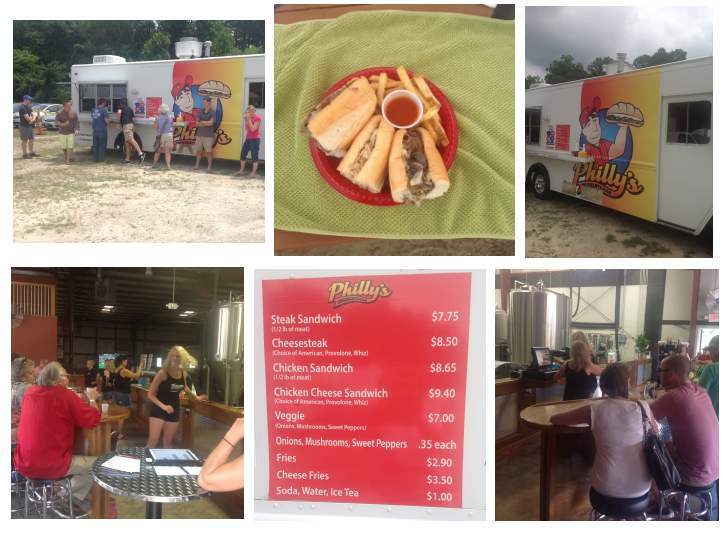 It was evident that only Philly’s Cheesesteak truck was the only one to make it to the grand opening that afternoon. The others who had been scheduled had reported on twitter that they had problems, and would not be able to attend. The menu for Philly’s Cheesesteak was straightforward, plain chicken or steak or chicken cheese sandwich, or cheesesteak sandwich. There was also a veggie sandwich. You could have it topped with onions, peppers and/or sweet peppers. There was also a side of fries, or cheese fries. We opted for chicken cheese sandwich and cheesesteak sandwich, with a side of fries to sample from. I had optioned mine with Provolone Cheese, mushrooms and onions. All the sandwiches, chicken and steak, were hearty and satisfying, especially with a good crafted beer. The fries were firm and crispy. It was good food and went well with the festivities. I must admit, when you consider that choices were limited, everything worked out – especially the food. The Draft Line Brewery had planned an outstanding event with Sol Tacos, Valentino’s, Philly’s Cheese Steaks, Red Eye BBQ, Deli-icious, Jam and Stephens. However sometimes even the best laid plans go awry. I had my food selections picked only to find that Sol Taco and Valentino’s were not coming due to problems with their trucks. I have no idea why Red Eye BBQ failed to show up. The Philly Cheese Steak truck was the only food truck, and were super busy. There was a small cart which was serving hot dogs, sausages and pizza. I opted for a plain steak with raw onion and mushrooms. I am on a diet so had left off the cheese. The sandwich was okay, it was not the cheese steak I had sampled in Philly. It lacked seasoning. I probably should have added the green peppers, and this would have improved the flavor. The steak was of good quality and was tender. Belle had selected the chicken cheese steak. It too was under seasoned. The meat to bread ratio was good. The French fries were awesome. The cheese steak with provolone, onion and mushroom did not bring back the memories of the cheese steaks I had eaten while living in Pennsylvania. The band, Camp Ground was good. I enjoyed their music. I did have the opportunity to meet Paul and his lovely wife Susie. I hope to meet up with them again to continue getting to know them better. There was not enough outside seating present at the event and hopefully at Draft Line’s next event this will be rectified. Parking was ample and well organized. All in all a very pleasant day despite the overcast weather, spent with friends. It was evident from the time we arrived that Draft Line Brewing had put a lot of thought into organizing their grand opening. The attendant at the gate made my day when he asked to see my ID. He then went on to explain the coupon system for the tap room and outside stations. Thus eliminating the frustration of standing in line to purchase a beer to only find out you needed a coupon not cash. Due to the mechanical problems being experienced by two of the scheduled food trucks Philly’s Cheesesteak was the lone food truck. So why not turn this into a truck review opportunity. While waiting for The Traveler to arrive, I walked over to check out the menu and discovered pads of order sheets and pencils available. Since Philly’s sandwiches are made to order (you have all kinds of combos and add-in choices), this made ordering easy. It also assured the customer received the correct sandwich. All three of our sandwiches were exactly as ordered and they also accommodated us by cutting our sandwiches into thirds so we could sample each of the three we ordered. I found our cheesesteak selections to be flavorful with plenty of meat on good bread. Both the beef and chicken were tasty, tender and moist. The ratio of meat to add-ins was just right. Overall, I was pleasantly surprised with our sandwiches. However, I am not a Philly cheesesteak connoisseur so I’ll stick to 3 Tires for each of our selections. I was delighted to see fries on the menu instead of a bag of chips. Philly’s are “real” fries. They were hand cut and fried to perfection. I liked the steak. It was cut into thin slices and easy to eat. I liked the provolone cheese, but had no use for the onions or mushrooms. While the bread was soft and not soggy, I left it. I do not like chicken so I did not bother to even sample it. I did not eat the fries, even though they were expertly cooked. I loved the chicken cheese steak, eating everything except the veggies and bread. I enjoyed both the plain and the cheese steak. The meat was wonderful. I loved the taste and ate until I could eat no more. I left the bread, French fries and veggies, because I am a growing boy and I need the protein. Oh it sounds fantastic even though I’m not a cheese-steak person, I would love to try it sometime. I’m so glad the cats enjoyed it. What on earth is wrong with Bob? What cat doesn’t like chicken? And Jack, eat your vegetables!